Enter to win new vacuum sweepstakes for 2019. Below is a list that includes some of the best sweepstakes you will find on the internet. With chances to win great prizes, you do not want to miss out. Be sure to check back to this page every day to enter the fresh new 2019 vacuum sweepstakes as they are added. For daily entry giveaways, each day you enter to win is one more chance to get the prize of your dreams, and you do not want to miss out. Enter now for a chance to win a brand new and top-rated Dyson V7 Animal Cordless Stick Vacuum. It won our BEST of 2018 Award. Enter for a chance to win a BESTEK 2-in-1 Upright & Handheld Vacuum Cleaner with HEPA Filter (Black). Join for chances to win Ice cream maker / mug / $20 Amazon Gift card / Vac cleaner / Electric Kettle / Phone holder! One winner will win one Pure Clean robot vacuum cleaner. Enter our giveaway to get a chance of winning a brand new Dyson V8 Absolute Cordless Vacuum cleaner worth more than £500 / $500! Enter for a chance to win a Black & Decker Lithium Ion V16 Handheld Vacuum Cleaner. 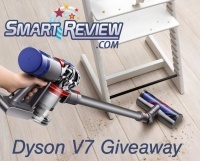 Enter for a chance to win a Dirt Devil Scorpion Quick Flip Handheld Vacuum Cleaner. Enter for a chance to win Bissell Pet Hair Eraser Handheld Vacuum. Enter for a chance to win a Shark Pet Perfect 2 handheld vacuum cleaner. Enter for a chance to win Light 'N' Easy 2-in-1 Vacuum & Steam Mop. Allow you vacuum small dust and hair and steam hard floors at the same time. Easy Button Foot-Step Controls let you switch between functions so you can vacuum and steam at the same time or separately to match the right clean to the right situation. Finish installment in 10s.